Click on the relevant picture to download a catalogue. 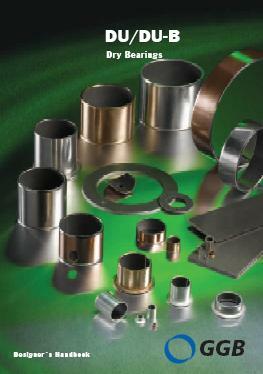 Glacier Garlock Bearings is the inventor of the Glacier bush - the high performance bearing material. consequently, has the broadest application range. DU bearings combine the advantages of many conventionally lubricated, metallic plain bearings — particularly high load capacity and dimensional rigidity — with the design freedoms of self-lubricating materials, including the ability to operate successfully well beyond the scope of conventional lubricants. DX™ bearings offer extraordinary operating advantages and a wide range of design possibilities. In slow speed, oscillatory applications, or wherever conditions of intermittent operation or boundary lubrication exist, DX pre-lubricated bearings have opened a new dimension in performance capabilities for design engineers. The key to the superior performance capabilities of DX bearings is their unique construction incorporating a highly effective grease retention system. DX pre-lubricated bearings effectively fill the gap between fully lubricated bearings and dry bearings. They are referred to as “prelubricated” because they require only a trace of lubricant to operate satisfactorily and will, therefore, run for very long periods by drawing only upon the lubricant introduced on initial assembly. Both DU and DX are available in standard-size bearings from 3/4" to 5" ID, including specified standard or special lengths up to 16''. Metric size bearings are also available in standard sizes from 20 to 150 mm. 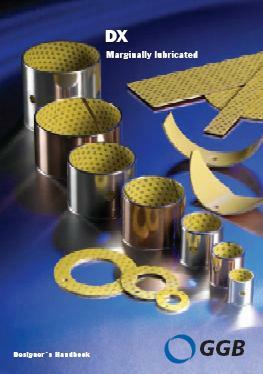 Both materials are also available as flanged bearings and wear strips. Laboratory and field testing have indicated that both bearing types provide outstanding performance in a variety of dry or lubricated bearing applications and are ideal for many 'tough' bearing applications. These include off-the-road vehicles, agricultural and automotive equipment, windmills, materials handling equipment valves, textile equipment, processing equipment, packaging machinery, and many more. Thyssing Industries Supplies is proud to be the sole importer and distributor of this product in Australia. For information on other GGB Products, please follow this link to the GGB website.